I have really wanted a Tiki bar for quite som time. It's nok gonna happen in my tiny house, but I can dream and build one from lego. Which is what I did today and then I decided to celebrate it's grand opening with a drink I have been craving since I mixed the Karmic Alarm Clock a couple of days ago: An Espresso Bongo. It is a drink created by the the worlds most knowledgeable expert on Tiki cocktails, Jeff Berry also known as Beachbum Berry. According to this recipe he had always wanted to name a cocktail after the 1959 film Expresso Bongo and got his break through when he mixed espresso, fruit juice and rum. I have tinkered a little with the recipe - I know it's almost sacrilege - mainly because I seldom have passion fruit juice or nectar but I do have a commercial passion fruit syrup which is as sweet as simple syrup. Also I simply wanted to make the recipe easier to remember - for seconds. So I suggest you try the original if you have fresh passion fruit and only revert to my take if you have to use passion fruit syrup. Add all ingredients to a shaker, fill it with ice, shake and then cocktail and ice into a low glass. 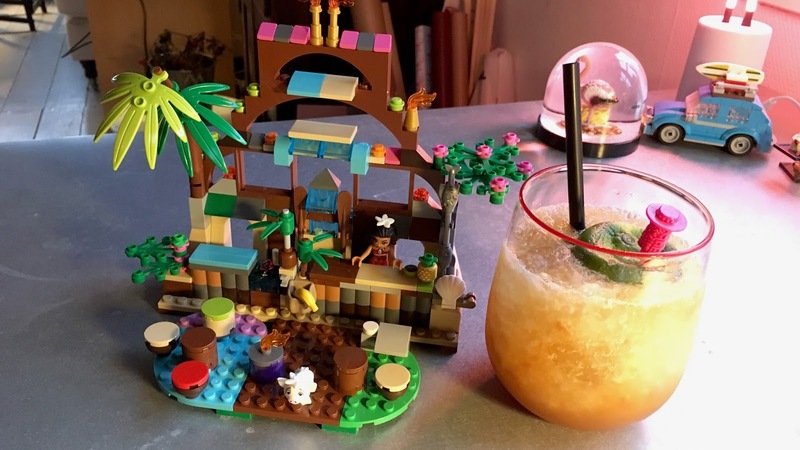 Garnish with a Lego tiki bar - or what ever floats your drink. How fair is it to try a recipe for a cocktail, when half the ingredients are out of your reach and you have no way of knowing, what the end result should taste like? Not very - if you do it for any other reason than: But it's the only way I can get to taste this mix that intrigues me! The drink originates from SoBou, a bar I have visited a couple of times. Unfortunately I do not think I'll get to visit New Orleans or SoBou in the foreseeable future. I remember finding SoBou's cocktails and bar menu playful and fun - but not over the top crazy. 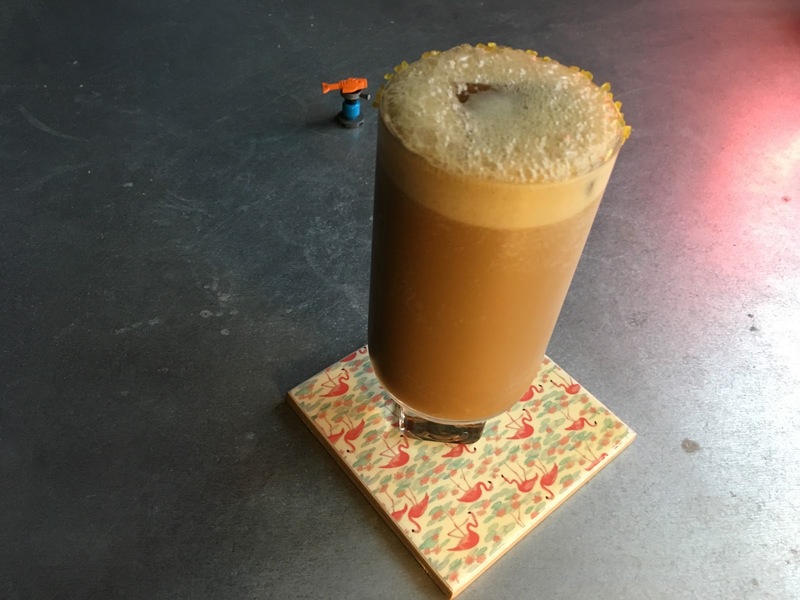 When you read a recipe of a cocktail containing curry caramel you might think: That's over the top -especially as it is partnered with rum, cold-brew coffee and the Italian artichoke bitter Cynar. Old New Orleans Cajun Spiced Rum is not for sale in Denmark, so I had to find a substitute. I've read a few reviews - some of them talk of a rum with strong hints of Christmas spice. I suppose I could try spicing up a golden rum with som cinnamon, nutmeg, ginger and clove but I have to admit - that particular mix is not a favorite of mine. Instead I decided to use a mix of Stiggin's Fancy Plantation Pineapple and Myers dark rum. My reasoning goes like this: Pineapple play well with curry and equally important with coffee. My next problem was the call chicory cold-brew coffee. Whatever substitute I could find in Denmark would never match the original New Orleans coffee. So instead I went for a strong espresso - which is probably at the exact oppersite end of the coffee scale to chicory cold-brew - but Espresso Bongo. And then on to making the curry caramel. I started by dividing the recipe by 4 - I might love this cocktail, but not enough to drink the more than 70 that can be mixed from the amount of curry caramel the original recipe makes. And no I did not cook an extra salted caramel just for a garnish, I simply rolled half of the mouth of the glass in a little of the curry caramel and then som yellow sugar. I am lazy that way. * I cooked 250 g sugar with 1.25 dl of water over medium heat for a good 15 minutes and heated 6 grams of a strong curry powder in 2.5 cl of whipping cream until the cream just shivered on the surface. Just before adding the cream to the boiling sugar I poured it through a sieve. P.S Happy 60th birthday Lego-brick!